1 Each family member released one of the homing pigeons at the end of the memorial service. The flock of white birds soaring up into the blue sky made everyone feel hopeful. For those in attendance, the sight of the birds in flight was the perfect ending to the service. 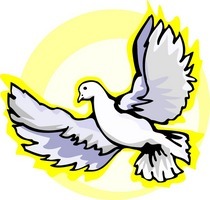 Releasing white homing pigeons is becoming a popular part of ceremonies of all kinds. 2 In the past, homing pigeons have been used for various purposes. These beautiful, intelligent creatures are able to find their way back home over great distances. These birds were first used by the Egyptians and Persians thousands of years ago. The birds that carry messages are called carrier pigeons. During World War II, the United States Army Pigeon Service used about 54,000 carrier pigeons for safe, secret communications. Homing pigeons are also used for racing, as well as being released during weddings, funerals, and other ceremonies.